----I would consider this man a Memphis legend. Our thoughts go out to the family. 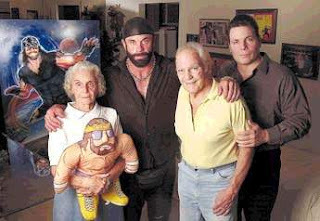 We are very sad to report that Angelo Poffo passed away peacefully in his sleep this morning in Sarasota, Florida. He was 84. Angelo Poffo was the father of Lanny Poffo and Randy "Macho Man" Savage. He had been in poor health for some time and was being cared for by his sons right up until his death. Poffo started wrestling in 1948 as The Masked Miser. During the 70's and 80's he wrestled as "The Carpet Bagger" for Emile Dupre's Atlantic Grand Prix Wrestling in the Maritime Provinces of Canada. During his time in the Maritimes, his two sons, Randy and Lanny, were also major stars for Dupre's promotion. He also formed a heel tag team with Chris Markoff, called "The Devil's Duo" and "The Graduates." He made a few appearances in WCW in 1995 and was inducted into the WCW Hall of Fame. Lanny Poffo has issued the following poem as a tribute to his father. And the World's Greatest Dad!